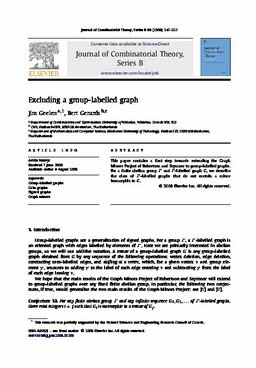 This paper contains a ﬁrst step towards extending the Graph Minors Project of Robertson and Seymour to group-labelled graphs. For a ﬁnite abelian group Γ and Γ-labelled graph G, we describe the class of Γ-labelled graphs that do not contain a minor isomorphic to G.
Keywords group-labelled graphs, gain graphs, signed graphs, graph minorsminors. Geelen, J, & Gerards, A.M.H. (2009). Excluding a group-labelled graph. Journal of Combinatorial Theory - Series B, 99(1), 247–253.